One of the items on my ‘2014 list’ page was to create a skin care routine and stick with it. Not that I had bad skin to begin with, but don’t we all want to preserve our youthful skin for as long as possible? Well skin doesn’t preserve itself so I went in search of some products that would work for me and my skin. I first put the word out to twitter to see what recommendations I could use and look in to. I was referred to ‘La Clinica’ and actually placed an order but after I hadn’t heard from them for a week and my order had not been shipped, I cancelled the order. Instead of choosing one brand and sticking to that, I decided to think back to what I’d used over the years that had worked and went from there. I once spent $200 on Clinique products after being pressured by the sales woman and I used it once before I decided it was too harsh smelling for my skin. It smelled toxic and like it would do my skin more harm than good. Since then, I have stuck to items that wouldn’t upset my skin as it is quite sensitive. 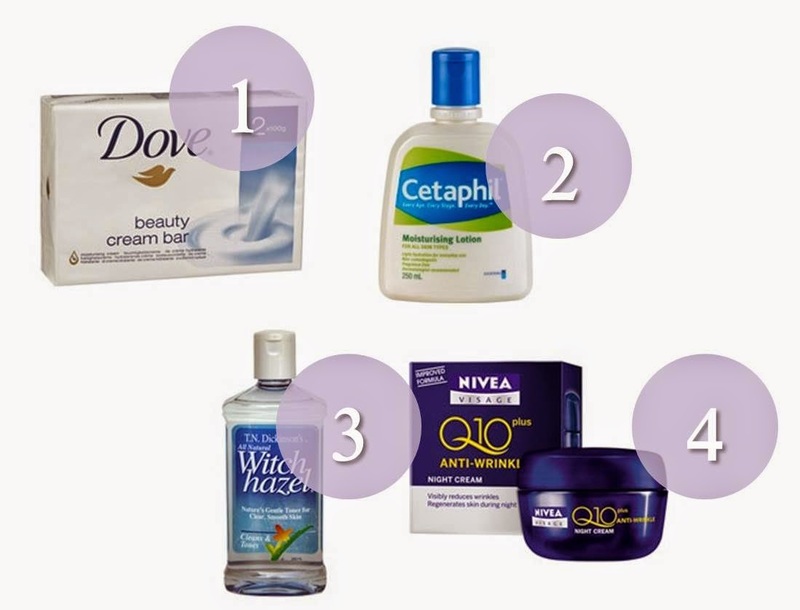 So, if you have sensitive skin the products below should be good for you to use. I’ve never (touch wood) had bad acne, so that wasn’t a problem I needed to consider. My skin is fairly normal – not too dry, not too oily, so I was basically just looking for products that would maintain my skin. Not change it in any drastic way. 1. To cleanse my face, I bought some dove beauty bars. They are cakes of soap that can be used on your face, that also include moisturiser so they don’t dry your face out. I use this in the morning and evening and have found they work well to take off all of my makeup. If I have used a lot of makeup (rarely), then I will cleanse my face twice to ensure it has all been removed. The dove beauty bar doesn’t have a particularly nice smell, but also doesn’t have an offensive smell. You can buy these for $4.49 from priceline (2bars). 2. After I cleanse my face, I use witch hazel toner. This is inexpensive and does the trick nicely to remove any further build up on your face. The smell is not the best, but I guess you do get used to it. Like the Dove beauty bar, it hasn’t upset my sensitive skin, so that’s another win there. I bought my witch hazel toner from priceline for $6.59 (240ml). 3. In the morning after these steps, I then use cetaphil moisturiser. It isn’t heavy and can be worn under makeup without your face feeling like it can’t breathe. It is inexpensive at $11.29 a bottle (250ml) and the bottle I have has lasted me a good 6 months already. S also uses this on occasion and he likes it as well. Cetaphil can also be used on children if that is any indication of how strong the product is. 4. In the evening after I have taken my makeup off, I use Nivea q10 plus night cream. The moisturiser is thick, however absorbs well and doesn’t feel suffocating like some thick moisturisers can. Again, this product is inexpensive at $19.99 from priceline. Obviously, what works for one person may not work for another, so take this list with a grain of salt. You may be able to use some, all or none of the products depending on your skin type. What products do you use the most in your skin care regime? Love the dove bars, have used since my mum started buying them for me when I was about 15! Also the dove moisturiser with sunscreen, and rose hip oil at night.